One of the turning points in my life happened sometime after midnight in a dorm room. I was alone, and I was praying. My first year of college had shown me that my faith wasn’t a strong as I thought it was and that my life was not in the order I wanted it to be. I didn’t know what to do. I’ll admit, that is not an attractive sounding prayer. But I had prayed more attractive prayers and they hadn’t led anywhere. For years, I had asked God not to “break me” but to “make me” into the kind of person I wanted to be, and I thought He would like. But that didn’t seem to help, even when God gave me what I asked for. My spiritual life was like a balloon: push in on one side, bring some part into conformity with God’s will, and I would just bulge out into something bad somewhere else. Instead, what I needed to do, and finally did in that dorm room, was admit something obvious. I couldn’t build my own Christian life, and in fact, so long as I insisted on setting goals and being in control, I was actually building something that would need to be torn down before God could begin to make me new. I am not going to say letting God break me so that he could begin to make me new was a fun process. I went from being a Christian who had an answer for everything and was a leader in my church, to one who didn’t know much of anything, and made a lot of people wonder if I had lost my faith – in fact for a period of time, I did lose my faith. It took years of God’s patient laying of foundations and building up of walls to make my heart His home in a stronger way than it had been before. But that process I let God begin in that dorm room was the best thing I ever did. When I look back on it now, it tells me this basic truth: None of us can make followers of Jesus of ourselves. None of us can renovate our own lives and hearts to make them acceptable to God. All we can do is hand our lives over, hand our faith over, hand everything over to God. That handing over means, must mean, giving God permission to break things and wreck stuff if it is necessary to make us who He has intended us to be since the beginning of time. What do you need to give God permission to “break” in your life? Maybe your need is as big as mine, maybe you need to give him everything. Maybe you have given him much already, but have reserved a small corner or two as your own project. Lent is a good time to not just do things for God, but to give Him things. It is a good time to realize that sometimes things we love have to be torn down so that God can build something better in us. The Rev. 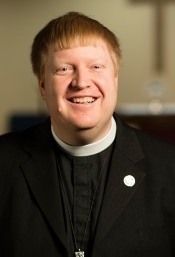 Peter Frank is Senior Associate Rector of Church of the Epiphany, Herndon, VA.